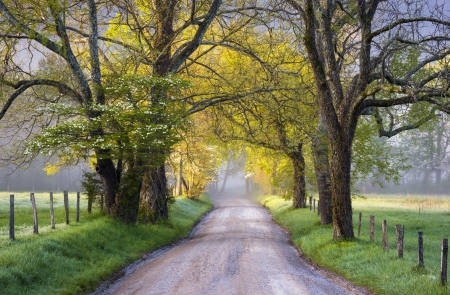 In the Cades Cove Sparks Lane Wall Mural, dogwood trees bloom on a frosty morning along this scenic road in Tennessee's Great Smoky Mountains National Park. Choose your own size and material. We were looking for a mural that would enhance our "bring the outdoors inside" to our newly remodeled bathroom in our cabin located near the Great Smoky Mountains National Park. We were delighted to find the Cades Cove mural featuring Spence Lane off of the Cades Cove Loop Road. Cades Cove is one of the most iconic areas located within the park. We have hiked across Spence Lane on many occassions. Utilizing the MuralsYour Way instructions the installation was a huge success. It finishes off the bathroom with a wonderfully peaceful scene.